Holiday Savings on Associates In Dermatology Gift Certificates!!!! Associates in Dermatology offers gift certificates for all services, procedures and products! 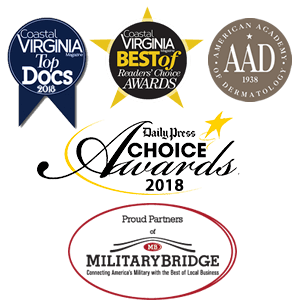 Certificates are available for purchase in our offices located at 17 Manhattan Square Hampton, VA 23666 as well as here on our website. Credit Card (in Office) American Express, Discover , MasterCard and Visa. There is no fee to purchase a gift certificate. Certificates expire one year from date of issue. We will gladly send the certificate to the address indicated on the on-line order form. Attractive envelope and seal included with purchase. (example: if purchasing for a 33rd birthday, you may purchase a $333.33 gift certificate!). What can a recipient use their Associates in Dermatology Gift Certificate for? An Associates in Dermatology Gift Certificate is a great choice for employee incentive programs, staff gift-giving (Administrative Professionals Day, Christmas, Hanukkah), or customer rewards!